Our ornament and votive holders are unique because each piece is hand painted using a process called reverse glass painting. 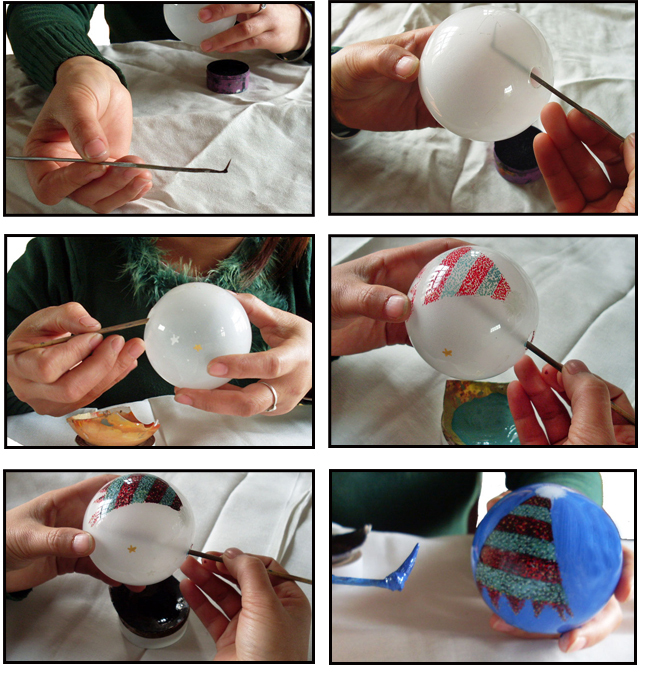 The painting is done from the inside through the holes at the top and bottom of the glass globe using special narrow brushes and pointed sticks. Each piece has the design detail applied in layers over several days. It is a very exacting art form. Each image is actually painted in reverse order on the glass. The finishing details of the painting must be put on the glass first, and must be done accurately as this is immediately covered with the next phase of the painting. This means the smallest finishing touches are done first, with the background completed last. For each ornament the process is the same, each one takes three days to complete. Bolihua or reverse glass painting as it is commonly called has been an art form in China since the early 18th century. 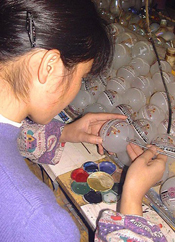 It is the only place where this type of painting is being done and each artisan must perfect their painting technique over years, it is a highly skilled profession. We have combined this ancient process with contemporary design to bring you the best of both worlds! We can also personalize all of our designs, please refer to our customized section for more information on this possibility!